Knife-slit design with a reinforced hole. 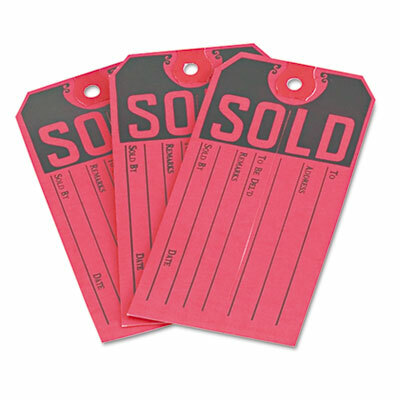 Update the status of your items for sale quickly with these easy-to-use Sold Tags. Printed with black ink on eye-catching red cardstock so shoppers can quickly spot what's been sold. Preprinted lines let you fill out buyer, seller and delivery information for easy reference. Enjoy the ease of the knife-slit design, or thread a fastener through the tag's reinforced hole.